This forecast was published 03/23/2019 at 7:06 AM. This is an archived avalanche forecast and expired on 03/23/2019 at midnight. Dangerous avalanche conditions exist today with large, natural avalanches becoming likely. Fifteen to eighteen inches of new snow combined with loading wind speeds from the northwest are creating wind slabs that are capable of producing very large natural avalanches. 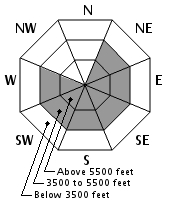 Avalanche danger for the Presidential Range is HIGH today. Travel in avalanche terrain is not recommended. The exceptions are the Northern Gullies in Huntington and the Right Side of Tuckerman which have CONSIDERABLE danger. Protected areas and lower elevations harbor softer storm slabs that are likely to be sensitive to a human-trigger. The USDA Forest Service Mount Washington Avalanche Center has issued a backcountry avalanche warning for the Presidential Range. Avalanche warning criteria may also be met in other areas outside those forecast by the avalanche center. 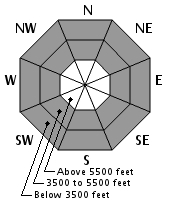 This avalanche watch does not apply to operating ski areas. Avalanche danger will increase through Saturday, March 23, 2019, with very dangerous avalanche conditions on and below slopes steeper than 30 degrees. Natural avalanches will be likely. Travel in avalanche terrain is not recommended. Yesterday’s nor’easter delivered 1.1” of water to the Presidential Range. This fell as snow at mid and upper elevations with just over 15” landing on the summit (6288’) and at Hermit Lake (3800’) and 18” at Grey Knob (4370’). The first half of snowfall arrived on wind that started from the SE and then shifted to NE in the 30-45 mph range. Wind speeds slowed significantly around dark and then quickly ramped to 50 mph from the NW. The bulk of the storm has passed, though higher elevations will see another 2-4” of snow this morning. Wind will remain from the NW in the 70-90 mph range for the day as skies begin to clear later. Wind will shift toward the west tomorrow and drop slightly with a chance of snow. The bullseye data for growing natural avalanche danger is heavy snowfall yesterday accompanied by increasing wind today. Wind from the NW today will load east-facing slopes, increasing the load in steep terrain and stressing weak layers below. These wind slabs will likely be reactive to triggers due to the lower than forecast overnight wind speed. As this load increases and stresses the upside-down nature of the snowpack, instability will peak and large natural avalanches will become likely. Lower than expected wind speed has likely left some snow with little wind-effect. These storm slabs may appear soft, but will have an upside-down structure and may be touchy to human triggers. With storm totals so far up to 18” in some locations, an avalanche in this snow will easily be large enough to bury a person. Today’s stability concerns today are located within the new snow that fell yesterday. This snow fell on a mix of icy melt/freeze crust and firm wind slab, both of which will act as a hard bed surface for today’s avalanche cycle. Periods of moderate to light wind speeds yesterday have created several soft layers that will act as weak layers today. The upside-down structure of the snowpack will be amplified today as strong wind from the NW continues to load easterly aspects. While the forecast wind speed will eventually increase stability with bridging strength, we will pass through peak instability today with some terrain capable of producing very large, natural avalanches. Travel in avalanche terrain is not recommended today. Local ski trails and glades will offer great alternatives to risking it in steep terrain. Posted 03/23/2019 at 7:06 AM.